Facebook Pushes US/Canada Users To Support Free Basics! Dear Facebook: This Is The Limit Of Desperation – Users In USA & Canada Pushed For Supporting Free Basics! The distance between USA and India is 13,568 kms, and Canada is 11,462 kms. How can a Facebook user from USA or Canada decide on the issue of Net Neutrality in India? But it seems Facebook doesn’t mind (or care) that. In a blatant display of desperation towards somehow getting the mandate for implementing their nefarious ‘Free Basics’ propaganda in India, Facebook is now pushing users in USA and Canada to support their shrewd cause. In USA, users reported being pushed with notification from Facebook, wherein they are encouraged, deceptively, to send a pre-written ambiguous email to TRAI supporting Free Basics. And the same has been reported by users from Canada as well, when a thread popped up on Reddit India with screenshots. As we had shared yesterday, such cunning ploy by Facebook is actually working, as TRAI has suddenly received close to 600,000 emails supporting Free Basics. With their international campaign for the same, we may now witness even more supporting emails from ignorant Facebook users, who are not even aware what damage a humble email can do. Even Americans are now wondering why Facebook is pushing their political, ambitious agenda in USA, when the decision has to be made by Indians, living in India. Forbes Wants To Kill Net Neutrality? Meanwhile, Forbes magazine has recently published an article, wherein they have wholeheartedly justified Free Basics, and wondered why so much outrage is happening in India against it. In fact, they have quoted our article on Trak.in, and shared one paragraph as well, asking the logic behind it’s severe opposition. The Forbes article is completely biased, over the top analysis of India’s economic growth vis-à-vis Internet access for poor. The author failed to acknowledge the long term negativities associated with such restricted, free access to Internet which can kill innovation, startups and ideas. Instead of understanding why Tim Berners-Lee, the inventor of the World Wide Web, has strongly opposed to Free Basics and anti-net neutrality plans, Forbes is trying to play along with Facebook, and somehow justify their attempt to enslave Internet. 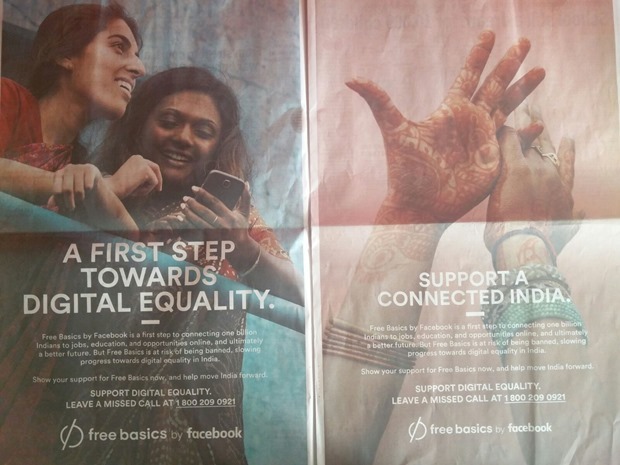 People should understand why Facebook is spending Rs 25 lakh+ for a full page advertisement in leading newspapers, just to offer Free Internet for poor in India! Advocators of Fair Market, Neutral Internet and Innovation: This is your moment of reckoning. Stand up and oppose Facebook’s evil plans to destroy Internet. Last date to submit your email is December 30, 2015. Sorry Mark Zuckerberg.. We cannot allow you to control Internet. "Dear Facebook: This Is The Limit Of Desperation - Users In USA & Canada Pushed For Supporting Free Basics! ", 5 out of 5 based on 4 ratings.